When I go to Scheels to buy fishing gear, it seems like I always go over my original budget. I’m sure we all have the same problem. There are ways where you can make that dollar stretch further. Whether you’re buying fishing gear or planning your next fishing trip, here are some things that can help you be a successful angler on a budget. We all have different budgets when we head out to buy our gear. The nice thing about fishing gear is that there is always a model that fits your budget. 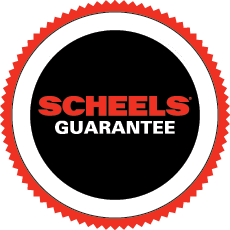 When you’re looking at a new fishing rod, take a look at what Scheels has to offer. You’ll find nice price points on a variety of rods, from their Trophy rods to the Scheels ONE Limited rods. I have fished with many of these rods and they have been great. Now which rod do you choose? For me I like to choose the model that will fit my budget. Then I’ll look at what fishing technique I’m buying it for. That will guide me to the correct length, power, and action. Many times I’m asked to go fishing with a friend and I don’t know what fishing technique we will be using, but we are most likely going to target walleyes. So in this case I’ll grab my 6’6” medium power, fast action Scheels ONE rod. This is my go to rod if I’m uncertain on how we’ll be fishing. It is long enough so I can still pitch cranks, stiff enough to jig with puppet minnows, and sensitive enough to use for rigging. If I knew we were going to be fishing a certain way before heading out, I would grab the rod that would work best for that fishing technique. One of the most common fishing techniques in the Dakotas and many Minnesota lakes is fishing with spinners. I highly recommend you buy the spinner components in bulk. You can buy the hooks, beads, spinner blades, and speed clevis and tie your own rigs. This will save you money and ensure that the knots and components are of higher quality. Another advantage of tying your own rigs is that you can pick the color patterns that you want. We lose so many spinner rigs to northern pike and those losses can add up quick, especially fishing Devils Lake, ND. One of my favorite fishing techniques is fishing with crank baits. There are so many brands of cranks on the market today. It is very easy to go over budget when buying cranks because of the prices. The crank baits that I have found to be very successful and great for my budget are the Berkley Flicker Shad and Flicker Minnow, as well as the Scheels FatEye Cranks. There have been many fish caught on these lures in the past years. Last year I fished a lot with the different models of the Scheels FatEye crank bait and they work awesome. While it is important to find the right fishing gear to be successful on the water, it is equally important to plan your fishing trips around your budget. This can be very easy! My spring trips are usually to the Rainy River for early walleye and lake sturgeon action. The lodging up there is as low as $45 per person per night and the fishing is phenomenal. When targeting walleyes you just need to bring a handful of jigs and that same 6’6” Scheels ONE rod. The lake sturgeon can be caught using the Scheels Crazy Cat rod spooled with some 60 pound braid and a 5/0 circle hook. During the summer I’ll get up to Devils Lake to fish from the rocks or bridges to catch limits of walleyes. This is a very budget friendly way to catch fish. Call a friend or two and drive up in a car. No need to pull the boat. Using jigs and bobbers on the windblown shoreline can yield good results. You can use two rods in North Dakota, so I’ll usually throw a bobber out and cast a jig with my second rod. So whether you’re buying new fishing gear or planning a trip for your next fishing outing, there are ways you can be successful while staying within a budget. I hope you are able to get out and enjoy the outdoors.